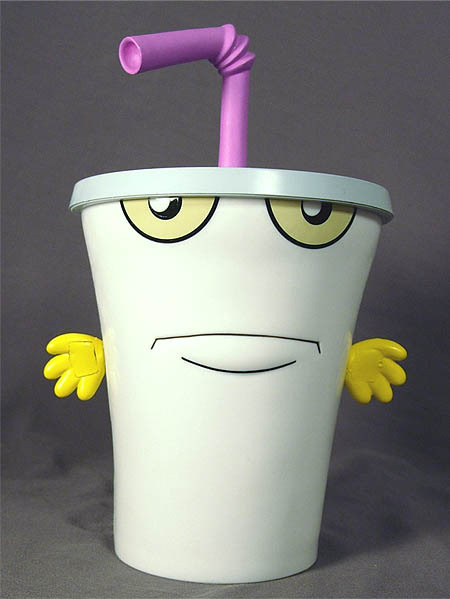 Master Shake is brutally simplistic. 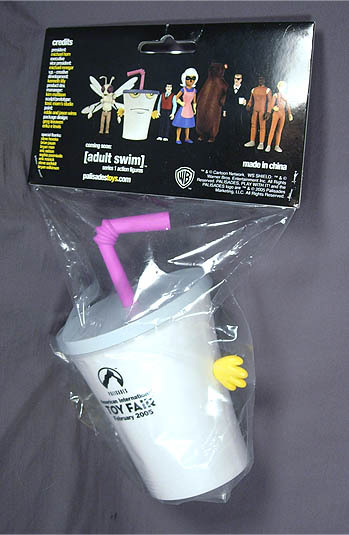 What you see is exactly what you get-- aside from the articulated straw, this thing's a big giant PVC. 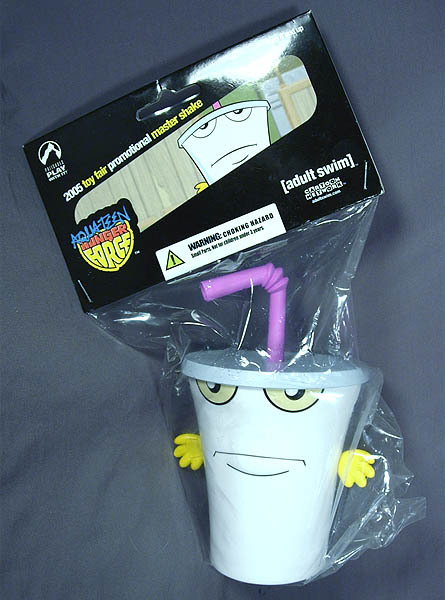 Still, highly recommended for fans of Aqua Teen Hunger Force. 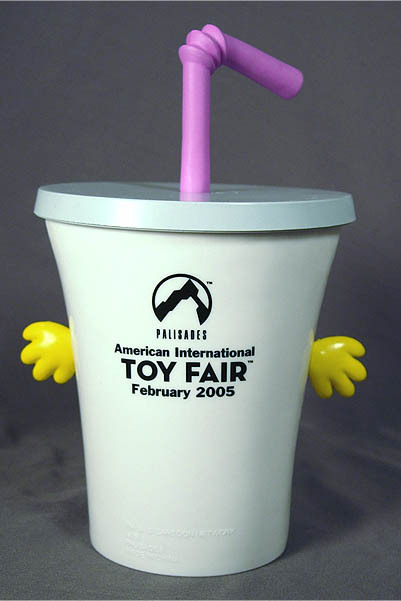 Free at New York Toy Fair 2005. 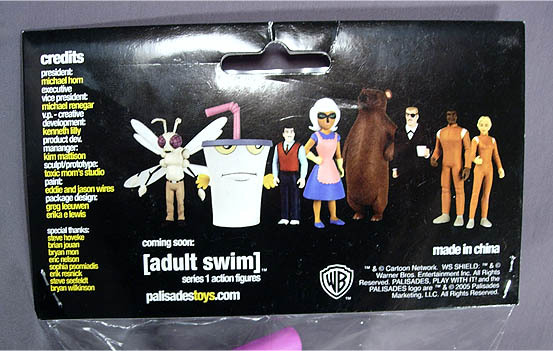 Palisades delighted fans by picking up the Adult Swim license in 2004, and in early 2005 they released their first mass-produced but still highly limited item with this Master Shake "action figure." We use the ironic quotes because this thing is the same size as a small milkshake from your favorite fast food place, and has about the same play value. Except here you can't take off the lid. What you see really is what you get-- the skilled artisans at Palisades are dynamos of turning odd materials into a good action figure, as seen in their Muppets lines as well as Invader Zim... for the most part. 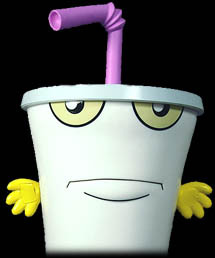 Master Shake is an excellent translation of a 2D design into the 3D realm. His straw can twirl about, but that's really all he can do-- his hands feel like they'll snap off if you twist them, so we advise you not twist them. The deco is simple, but effective. Rather than leaving the area surrounding the mouth unpainted, they added a black outline which really makes it stand out and look more like its animated counterpart. As this was something rarely done for The Simpsons, but often done by Gundam builders, we can safely say we think it's a good thing. The back of the figure is branded to show that it's a Toy Fair exclusive, but odds are the regular release will be pretty much the same as this one. Minus the black printing, that is. 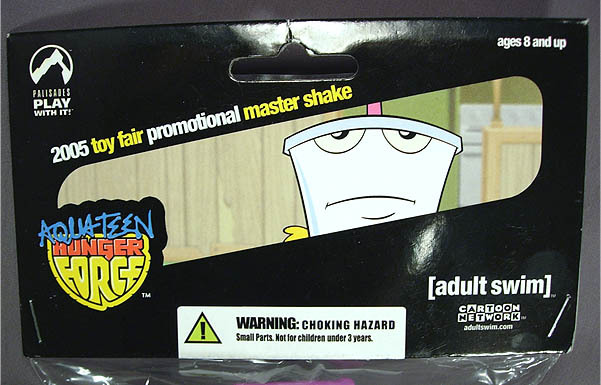 This toy came packaged in bag with a header card previewing some future figures that will be released later on..
Like the figure inside, it's simple and gets the job done. Anything too fancy and they might have charged you for it-- as such, we're glad it's free. Much like most figures from animated series aimed at adults, your interest in this figure will most likely squarely come from your interest in the character. Love him? You'll love this. Hate him? Pass. The figure breaks no new ground-- but this isn't a bad thing. Anything more complicated in this would come off as inferior, we believe, and as it is this is one fine release. Aside from the Palisades markings on the back, we daresay there's no way to improve on it. It's currently somewhat cheap on eBay, so we also say you should get while the getting remains good. Snag it if you can get it for a good price, orbiting $10. Reviewed on March 2, 2004.